Qadran, the Franco-Qatari economic circle, is an independent association under French Law (1901 associations’ law). It was created in 2015 on the initiative of the Qatari business community in France. Qadran aims at strengthening exchanges and enhancing the dialogue between companies and French opinion leaders, in order to promote the understanding of mutual economic interests and to generate business synergies in a free, objective and pleasant platform. The association organizes several events each year: breakfast-debates, prestigious conferences, gala dinners, networking meetings; an annual seminar will also be held in France, as the key meeting of the Franco-Qatari business relationship. Qadran initiates publications (studies, notes, reports) oriented around the French-Qatari economic relationship. Qadran encourages business synergies, allowing its members to gather, share their experiences, and join forces. Qadran deals with tomorrow’s economic leaders by establishing partnerships with renowned French institutions (think tanks, Grandes Ecoles, universities). The activities of the Circle are supported by a Scientific Board, gathering Qatari and French leading figures, from diverse backgrounds: entrepreneurs, economists, experts and intellectuals. Together, the members will debate and establish the main topics of interest. « It is a great honor for me to succeed Mr. Omer Acar as the President of Qadran. QADRAN, as you may already know, is a Qatari initiative in France launched in 2015 to promote debates and dialogues between companies and economic leaders of both countries. The meetings we have held were good opportunity for all members to respond to the challenges, and to make Qadran an exceptional organization for French Qatari economic and cultural actors. Since my arrival, I have been very happy to see the motivation which our circle has been able to arouse. Our ambition is to move forward and enrich our actions with your support. 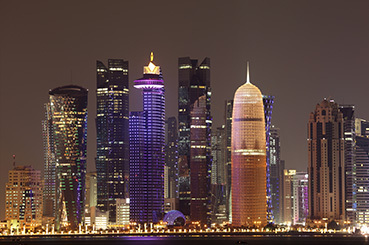 In 2017, the economic exchanges between Qatar and France amounted to 2.7 billion euros, an increase of 30% compared to 2016. This result illustrates the dynamic relations between both countries and their willingness to intensify these exchanges. As you know, 2020 will be the cultural year of Qatar in France. This event demonstrates the old and solid friendship between Qatar and France and the desire of both countries to further develop their partnership. It is within this dynamic that QADRAN flourishes. The composition of our circle, which consists of entrepreneurs, economists and experts, makes it a unique place where analysis and different approaches can be guaranteed. Moreover, proximity is a crucial aspect of our collective reflection. I may also say the the various events that mark our activities this year represent exceptional opportunities for members to interact and come up with new ideas. The Qadran is composed of a Scientific Board bringing together French and Qatari business leaders, experts and intellectuals. The Scientific Board sets the main topics for debate. It animates the association by moderating discussions during events (breakfasts, roundtables, meetings…). It suggests themes and speakers and also takes part in the annual seminar.